The NEW colorcalm™ by Design DVD transforms your television into a constantly changing interpretation of abstract art, color and design. Renowned artists Irma Boom, John Maeda and Peter Saville create a continually moving and adapting canvas of colors, shapes and expressions based on some of the world's most influential works of art. "Art Barcodes", by Irma Boom. the global color authority, the colorcalm™ by Design DVD brings together several of the world's most creative designers and musicians to create ambient design and atmosphere for your living space. Colorcalm's™ by Design DVD works on all TVs and includes a 20-page booklet about the inspiration, motivation and color design of each interpretive work. The soothing soundtrack features the works of Michael Nyman, Ryuichi Sakamoto and New Order/Terranova. Customizable menus allow you to individually loop, or play a sequence of the four main chapters of the DVD: "Art Barcodes", "Food Coloring", "Colour Wheel" and "Blue to Red". The informative subtitles can be turned on or off. 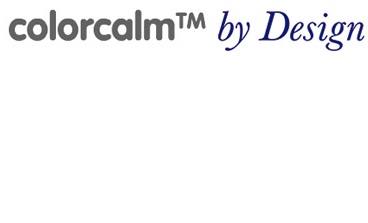 The colorcalm™ by Design DVD is Available Now!